Slip into the La Sportiva Cobra Climbing Shoe when you want a top-notch blend of edging performance and supreme sensitivity. These shoes turn dime edges into sidewalks and give you the precision feel needed to finally send your long-standing project. Whether youare clipping bolts or climbing above the crash pads, the Vibram XS Grip rubber keeps you glued to tiny jibs and desperate smears. 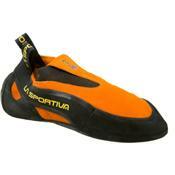 La Sportiva used an unlined, slip-lasted design to give the Cobra a feel thatas one step from the comfort of bare feet.